Delays moving debris in the Virgin Islands. Piles of debris collected from last years’ storms were supposed to be gone months ago. The first shipment just left at the end of September with just over 13,000 cubic yards of debris. The Virgin Islands has in total nearly 600,000 cubic yards. That’s enough to fill 177 Olympic size swimming pools. Eric Stevenson Adams from the Federal Emergency Management Agency has been keeping us in the loop of the sites progress since this summer. When talk of getting rid of the debris was at its’ height. But the project has dragged on. More than 180,000 cubic yards of vegetative and construction debris St. Thomas and St. John is being temporarily staged here at the Cancryn site. On St. Croix, 385,000 cubic yards of debris has been collected and is temporarily staged at Body Slob. CBS USVI was told in a statement from FEMA more vegetative debris reduction will be completed within the next month. FEMA said barging of marine debris will begin late this month, first on St. Croix then from St. Thomas. FEMA told CBS USVI “contractual issues led to barging of debris from the Cancryn site on St. Thomas in September.” “Challenges with contracts occurred from permitting and logistics of getting barges in place after permits were approved,” Adams added. 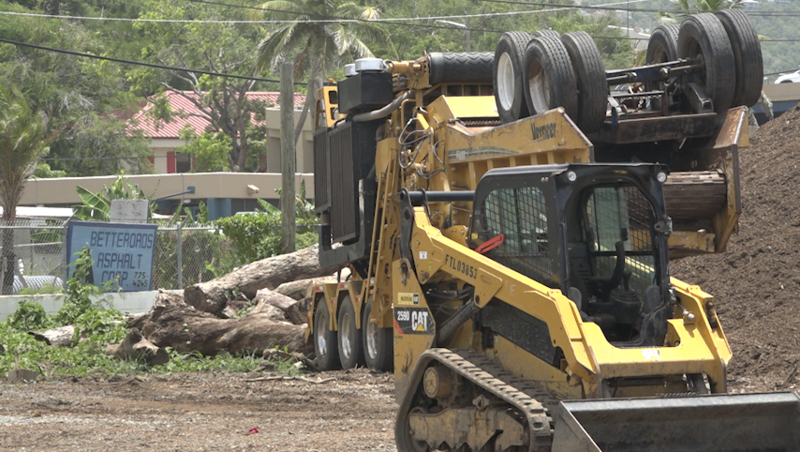 If you’re on St. Croix you can take some of mulch from the Agriculture Complex in Estate Lower Love from 730AM-11AM in the morning and 12PM-330PM in the afternoon Monday through Friday.